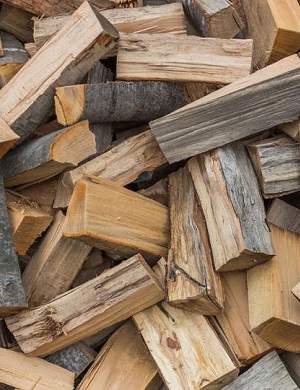 We stock a wide selection of fuels, which include ready to burn logs, wood shaving bricketts, wood pellets, kindling, E-Coal, and brown coal, plus environmentally friendly firelighters and long matches. Our solar dried logs are not only a carbon neutral fuel; they are also ready to burn. They also burn hotter and more efficiently than other types of wood fuel. As less energy is wasted burning off residual moisture, more energy is converted into heat and higher temperatures are achieved. As they are greater in efficiency, this means they are more economical to burn, as you use less fuel to achieve the same heat output. Burning logs releases the same amount of CO2 into the atmosphere as was absorbed by the tree during its life cycle. Therefore burning logs, or other wood products, is a carbon neutral process. Our wood bricketts are manufactured from virgin waste wood shavings and sawdust, which would otherwise go into landfill. Once pressed together, they have a very low moisture content, are clean to handle, very easy to light and last for several hours. Our wood bricketts have a pleasant aroma of fresh wood and very importantly do not expand when burnt. Wood pellets are compressed wood manufactured from agricultural and forest waste. They are used in pellet stoves/boilers and burn very cleanly. 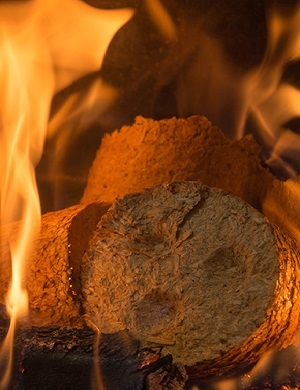 One of our eco solid fuels contains renewable materials, such as crushed nutshells. This means that you produce less CO2, but without compromising on its outstanding performance. We supply the above fuels either delivered or collected from our showroom in both large or small quantities. Another option to consider is making your own fuel out of waste paper using a paper mashie brickette maker, these burn well on stoves or open fires and last for about 1 hour. It is also a safe and permanent way of getting rid of confidential papers. A log moisture meter is a must for any person with a woodburner. It is very easy to use and enables you to check the moisture content of your wood before it is burnt. This ensures maximum heat output and that you only burn logs that are seasoned and dry. Our log baskets are an ideal way of storing logs and come in a range of sizes and colours. We also stock log hoops, which look stunning when filled with logs and a variety of log carriers to bring the logs into the house. If you want to chop your own kindling, we keep wood axes in stock.